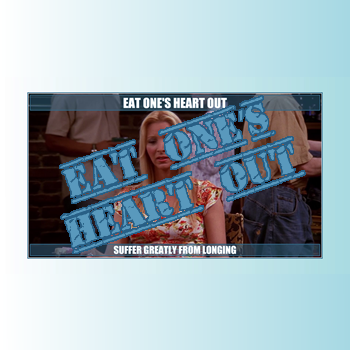 Eat one's heart out (Short video) - Learning English is AS EASY AS PIE with Phrases, Idioms, Expressions. The phrase of the day is: "Eat one's heart out"
If somebody eats his heart out, they suffer from excessive longing for someone or something. If you say "eat your heart out" followed by the name of a famous person, you are joking that you are even better than that person.